When planning a protest it is important to ensure that you have followed all the correct procedures. 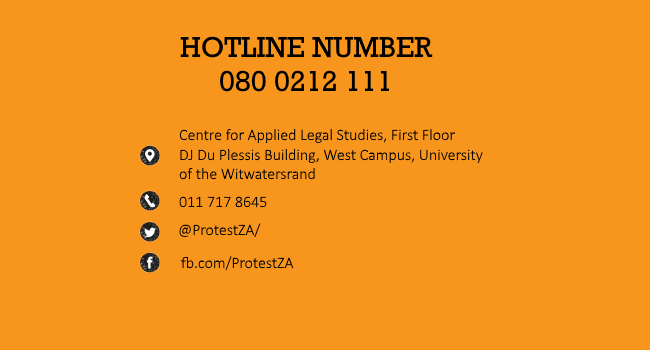 Your protest rights are enshrined in Section 17 of the Constitution of South Africa and are regulated by the Regulation of Gatherings Act, 1993. Step One: Identify the individuals who will be the designated convener and deputy convener of the gathering. Step Two: According to the RGA if a gathering will be attended by 15 people or less, you do not need to give notice. However, if the gathering will be attended by more than 15 people, you are required to give notice to the relevant authorities in your area. Step Three: All municipalities have a notice template which is used to give notice for gatherings, this should be available at your local municipal office. The individuals identified as the leaders of the gathering should fill in all the required information regarding the gathering and submit it to the responsible officer in your municipality. This should be done at least seven calendar days before the planned gathering. Step Four: After giving notice, you may be asked to attend a Section 4 meeting to discuss the logistics of the gathering. Once all these steps have been completed you should be able to go ahead with your gathering as planned.